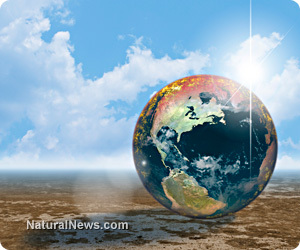 (NaturalNews) Apologists of the man-made global warming myth have launched a new counterattack against their opposition that ridiculously paints them as deniers of the climate itself. A recent study put forth by scientists at Drexel University in Philadelphia accuses those who question the official story on global warming of being "climate deniers" who are impeding "democracy" and threatening the persistence of the planet. With recent weather patterns casting serious doubt on the legitimacy of the global warming tale -- many areas of the U.S. recently broke cold spell records due to an extreme arctic chill -- the global warming crowd is in a panic. And to save face, they are now resorting to the basest tactics of name-calling and verbal ridicule in an effort to manipulate the collective mind of the public into accepting the idea of man-made global warming as legitimately scientific. "The climate change countermovement has had a real political and ecological impact on the failure of the world to act on global warming," said environmental sociologist Robert Brulle, author of the study, in a recent statement. "Like a play on Broadway, the countermovement has stars in the spotlight -- often prominent contrarian scientists or conservative politicians -- but behind the stars is an organizational structure of directors, script writers and producers." Notice Brulle's crafty use of language to insinuate that global warming is undeniably real, and that secret organizations are behind the push to expose it as a fraud. By comparing this rapid resurgence of climate truth to a "play on Broadway," Brulle hopes his readers will correlate a fictitious stage show to any person or resource that rejects the official story on global warming. But the truth is that Brulle and his allies actively pushing the global warming cause are the ones attempting to pull the wool over the eyes of the public. By "exposing" the alleged behind-the-scenes funders and supporters of the global warming truth movement, Brulle essentially draws attention to the other man behind the curtain of his own movement, which is far more questionably vested. As explained by James M. Taylor in a recent piece for Heartland.org, the global warming crowd raises far more money every year to push its cause than those trying to expose the truth about the global warming lie. The organizations Greenpeace and the Nature Conservancy, both of which subscribe to man-made global warming, together raise more money every year than the 91 so-called "conservative think tanks" assessed in Brulle's study. Not only are the figures used by Brulle in his study completely off -- the $1 billion that climate truth groups allegedly raise every year to oppose global warming propaganda is really more like $46 million -- his insinuation that the other side spends anything less is also deceptive. In truth, the global warming movement rakes in billions every year from organizations whose primary goals include promoting the concept of man-made global warming. "Five environment-specific groups alone raise more than $1.6 billion per year (Greenpeace, The Nature Conservancy, World Wildlife Fund, National Wildlife Federation, and the Sierra Club)," writes Taylor about how the global warming movement is funded. "When global warming activists claim global warming skeptics receive the lion's share of funding in the global warming debate, they are lying through their teeth."